As one of the largest nuclear power plants in the world, Bruce Power is a major energy supplier to the province of Ontario, Canada. This bustling, privately owned plant has two generating stations consisting of six operating units, and billions of dollars are being invested to refurbish two more units in the Bruce A Restart Project. The Bruce site will be the largest nuclear power plant in the world when all eight units are running next year. Approximately 10,000 people work at this massive site. With almost 100 buildings and even its own water and waste treatment facilities, it resembles a small city. For this reason, the company has invested heavily in an enterprise-wide, digital out-of-home (DOOH) network to keep the entire work force apprised of news and information to enhance productivity and safety. Bruce Power launched its TV initiative five years ago. The original communications plan called for producing a weekly television newscast from a closed-circuit studio, but that proved too costly and labor-intensive. A Harris InfoCaster media player purchased for other purposes was running in test mode in their studio facility. This became the seed that initiated the first phase of a full Harris DOOH solution with content creation, network management and media play-out components. The network started small with a few players in the security guardhouses, where workers queue to gain entry into the stations. More players were soon added in cafeterias and lobby areas. There are now more than 40 players in the network, several of which feed into existing fiber networks that distribute the show to screens throughout both power stations. Digital signage conveys a wide range of media content in a very impactful, visual way. This system supports high-quality graphics, data and full-motion video. The majority of programming over InfoCaster is created with the understanding that most employees and visitors have limited time to view the screens and are most interested in quickly consuming a wide variety of information at a glance. A single person manages the entire network, with five unique shows distributed to more than 100 screens. The Network Manager software allows the user to easily monitor and manage the players remotely and update shows and content with incredible power. InfoCaster’s TitleMotion graphics tool was used extensively to integrate and display the data sources with broadcast-quality graphics. All shows and content were developed with InfoCaster software on a single computer that works as the command center for the whole network, pushing out shows and content first to a shared network drive and then out to each player. A key factor in the design of the shows was having the ability to allow people with little technical experience to update content without touching the software. InfoCaster players pick up a wide variety of files as they hit the folder, and they quickly become part of the loop. The nuclear industry thrives on data. The signage system had to tie into real-time metrics to be relevant. Internally generated data sources constantly update information, including unit production and output, as well as vital on-site weather statistics and intake water temperature—the latter of which affects reactor efficiency. External sources also supply up-to-the-minute data. The Independent Electricity System Operation, which controls the distribution of electricity in Ontario, provides market data in a publicly available XML file. Information includes how much electricity is being used, market price and how much power is being generated from nuclear, wind, coal, gas or hydroelectric sources. Other external data sources include Environment Canada, which provides a seven-day RSS weather feed, complete with local weather warnings. The Weather Network provides a paid service for local weather radar. 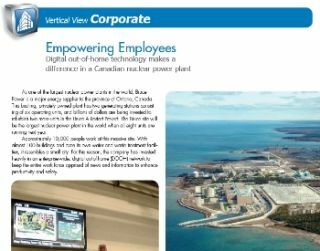 Another company manages a Bruce Power employee recognition program and provides a secure RSS feed of the 10 most recent employees who are recognized for hard work. Bruce Power is pushing the envelope even further through custom applications, many of which are developed by software specialist Bannister Lake of nearby Cambridge, Ontario. A site-wide public address system notifies employees of emergencies, such as severe weather, road closures or other situations. But it’s difficult to know what’s happening if the message is not heard. When announcements are made in the control room, operators can now launch a Bannister Lake application, click on a prewritten message, edit as necessary and hit submit. The message appears on screens across the site within seconds. The work force kicks into high gear with a 24/7 effort when a unit comes offline during a planned maintenance outage for repairs or upgrades. It’s a highly organized campaign, and leaders that oversee work in the Outage Control Center have an application to quickly and easily update outage status and key work. Bannister Lake created a number of other apps, including a very specialized display for the Bruce Learning Center, a nuclear university where most on-site training occurs. Working with Bruce Power’s IT department, they tap into the training database to list the daily course offerings and classroom information. It is seamless and fully automated, similar to an airport arrival/departure board. Bruce Power TV is dynamic and ever-changing. Each step comes with technical challenges, but the network continues to grow and evolve with the help of Harris Customer Support, Bannister Lake and the internal IT department.